Let’s take a look at the men whose brains, muscles and nerves made this ship alive. At the time of commissioning there were nearly 2000 bluejackets and marines assigned to the Alaska. Of these only 500 had been to sea previously. The other 1500 men had for the most part had been in the naval service less than six months, had had "boot training" at Sampson, N. Y., some further basic training at Newport, R.I., and then two months additional specialized training in the Navy Yard, Philadelphia, or the building yard across the river at Gloucester City, N. J. Ranging from seventeen to fifty-seven years of age, with youth predominating, the men came from big cities, small cities, towns and farms from New England to the South. 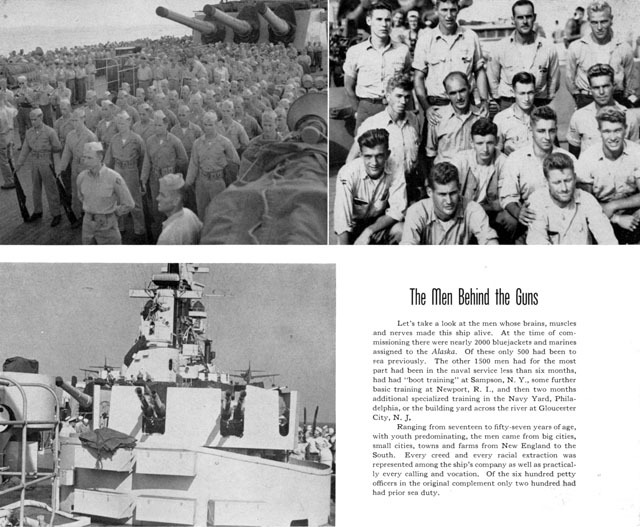 Every creed and every racial extraction was represented among the ship’s company as well as practically every calling and vocation. Of the six hundred petty officers in the original complement only two hundred had had prior sea duty.